I witnessed grassroots Minnesota politics today, and I was impressed. On a glorious, sunny but cold Winter Sunday in the capital St Paul , 430 voting delegates and hundreds of supporters and activists in the St Paul Central High School spent over seven hours of their Sunday eagerly debating the day’s issues and voting who would represent them in the state’s House of Representatives next session. They were all Democrats, members of Minnesota’s Democratic-Farmer-Labor Party (DFL), and in this solidly liberal Democratic district, 64B, they were sure to keep their representative in the House. 435 delegates cast their ballots in the first round, and by the fourth round, almost all of them were still there, patiently making sure their vote was counted and showing their appreciation in standing ovations for the candidates as they conceded, one after the other in round after round. Bergstrom, communications director for the progressive advocacy group TakeAction Minnesota, did surprisingly well. She handily beat the more famous Swedish American among the six candidates, young Matt Freeman, grandson of Orville Freeman, Minnesota’s governor between 1955 and 1961 and then Secretary of Agriculture in the Kenney and Johnson Administrations. He died in 2003. 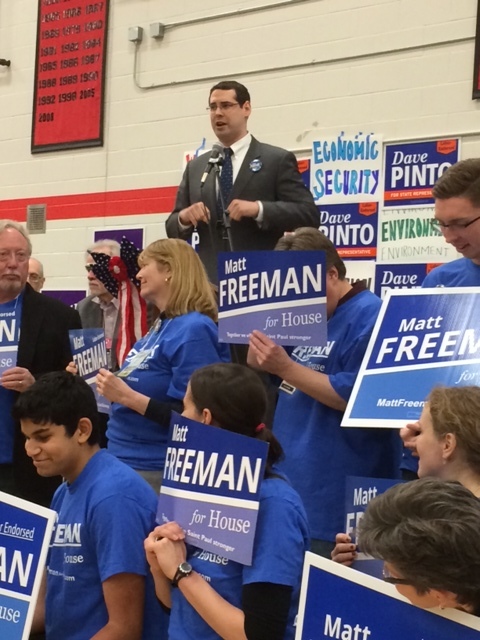 Matt Freeman, a graduate of Georgetown University, had recently managed St Paul mayor Chris Coleman’s victorious re-election campaign, He had lots of supporters in the packed gymnasium, among them his family, including his mother, grandmother, and father, Michael Freeman, who had been State Senator and who had twice run, unsuccessfully, for governor and who is now attorney in Hennepin County, the state’s most populous county. Yes, tough loss today, admitted the father, after consoling his misty-eyed son. But there seemed to be a general sense in the gymnasium this long Sunday that young Matt has the future in front of him. There will be many more election campaigns, some, surely, victorious. This entry was posted in Cities, Democrats, Elections 2014, Immigration, Minnesota, Politics, Sweden and tagged Democrats, DFL Convention, Election, Governor Orville Freeman, Matt Freeman, Minnesota, St Paul, State House, Swedish American. Bookmark the permalink.